A B333 cube floating in a LEV2 Magnet Levitator. 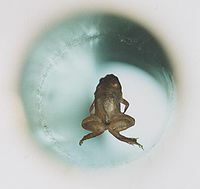 A live frog levitates in a 16 Tesla magnetic field at the Nijmegen High Field Magnet Laboratory. What is diamagnetism? What is pyrolytic graphite? Can magnets be levitated with it? How does a magnetic levitator work? Pyrolytic graphite is a strong diamagnetic material. It is a man-made form of graphite, which has some very interesting properties. In addition to being diamagnetic, it also tends to transport heat well across the plane of a sheet, but poorly through the thickness. What is diamagnetism? Let's define the term, along with a few others below. Where the definitions say, "...an externally applied magnetic field," think: when a magnet is next to it. Diamagnetic - A material that creates a magnetic field in opposition to an externally applied magnetic field. This weak opposing field produces a repelling force. Examples include pyrolytic carbon, superconductors and bismuth. Even water is diamagnetic, but only slightly. Paramagnetic - A material that creates a magnetic field in the same direction as an externally applied magnetic field, but doesn't retain any magnetization after that field is removed. Examples include ferrofluid, which is often classified as a superparamagnet. Ferromagnetic - A material that creates a strong magnetic field in the same direction as an externally applied magnetic field, and can retain some magnetization after the field is removed. Stuff that magnets stick to. Examples include iron, nickel, cobalt and refrigerator doors. A diamagnetic material is one that will repel a magnet. Even with the strongest diamagnetic materials, though, the force is very small. Recently, in an effort to highlight these small but interesting forces, some scientists used an incredibly strong magnetic field (16 Tesla, or 160,000 Gauss) to levitate a frog. The magnetic field is well over 20 times what you can measure around a strong neodymium magnet. The frog is made up of mostly water, which is mildly diamagnetic. The water is repelled by the magnet and makes the frog levitate, which makes for a very cool video. Check out the video below that highlights how the surface of water is ever so slightly depressed by a nearby magnetic field. Watch the shape of the reflection in the surface of the water. Pyrolytic graphite is much more diamagnetic than water, which means we can use it to experiment with diamagnetic forces using neodymium magnets. Pyrolytic graphite will exert a small amount of force on nearby magnets. What it won't do is make a magnet float in the air all by itself. The force isn't nearly strong enough. The force from the graphite is just a tiny fraction of the mass of the magnet, even with powerful neodymium magnets. With a thin piece of pyrolytic graphite, you can float the graphite over a bed of magnets. Check out the video below for a few examples of this. The beds of magnets are arranged on a piece of steel sheet-metal with alternating poles facing up (north, south, north, south, etc.). Let's review the concept of stability. Stability refers to the tendency of a system to return to a starting position all by itself. A classic example is the marble in a bowl. In the Stable bowl, at right, the marble sits in the center of the bowl, at the bottom. If you push the marble with your finger a bit to one side, the marble will tend to move back to it's original position. Sure, it may roll back and forth a few times, slowly dampening out. The key here is that the system tends to pull the marble back into the original position eventually. Now look at the Unstable bowl (the upside-down one). If you're really careful, you might be able to balance the marble on top of the upside-down bowl. When you push it slightly off to one side, however, the marble then tends to move further away from the starting position. The farther away from the starting position it gets, the stronger the force pulling it even further away from the center. 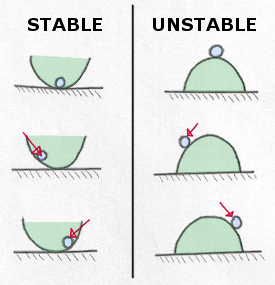 The unstable system wants to find a stable position with the marble on the table, on either side of the bowl. First, let's consider a LEV2 levitator without any pyrolytic graphite. There's just a lifter magnet, and a floater magnet. We'll keep the two pieces of wood in place around the floater magnet, just to constrain the problem. 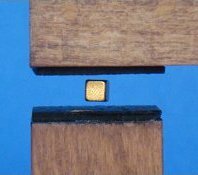 Here's a thought experiment: Hold the floating magnet in the air, midway in the air-gap between the two pieces of wood. Adjust the lifter magnet carefully so that the attraction force between the two magnets is just enough to hold up the floater magnet. Can it hold the magnet, floating in mid air? It certainly has the right amount of force. What's missing is stability. Consider this: When a tiny imperfection in the position of the magnet pushes it slightly up towards the lifter magnet (maybe a breeze), what happens? As the two magnets get closer together, the force between them increases. It's like the ball rolling off the upside-down bowl. The closer the floater magnet gets to the lifter magnet, the more it wants to move up even closer. It finds a stable position up against the wood stop. A similar thing happens when the floater magnet moves down, farther away from the lifter magnet. As it moves farther away from the lifter magnet, the magnetic force holding it up decreases, so it falls further down. The stable position is resting on the bottom wood stop. In the graphs below, we consider the total force applied on the magnet as a function of its vertical position between the wood blocks. Exactly in the middle, the forces of gravity and the lifter magnet acting upon the floater magnet are perfectly balanced. Below the midpoint, the negative force tends to pull the floater magnet down. Above the midpoint, the positive force tends to pull it up. Now let's consider the full-fledged LEV2 magnetic levitator, complete with two small pieces of pyrolytic graphite. 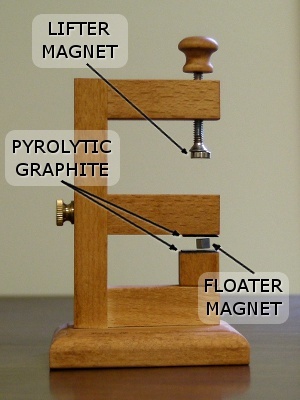 When the floater magnet is close to the diamagnetic pyrolytic graphite, a small magnetic field is generated within the graphite that opposes the magnet. It repels the magnet ever so slightly. The force is much less than what the lifter magnet or gravity is imparting to the floater magnet, but it's enough to add stability. See the force vs. position graphs below for a visual depiction of what's going on. With the graphite in place, the floater magnet is repelled away from the graphite sheets when it gets right up against them. What's more, these forces tend to push the magnet towards the middle of the gap, where the force levels out at zero. When the magnet is bumped off center, the forces tend to push it back to the middle. The magnet is stable floating between the layers of graphite; it is stable like the marble inside a bowl. With our LEV2 magnetic levitator, the size of the gap between the two pieces of graphite is adjustable. Keep in mind that you can only make it work if the gaps are relatively small between the magnet and the graphite. If they are positioned too far apart, the magnet will not be stable in the middle. The video below shows the LEV2 magnetic levitator in action, with a B333 block magnet (included) as the floater magnet. Ordinary graphite that you find in pencils isn't as diamagnetic as pyrolytic graphite, but it is diamagnetic. Check out this cool demonstration with a piece of pencil lead. CORRECTION: Use 20 D48DIA magnets to create the assembly as shown in the video below. The pencil lead is normal 0.5mm diameter graphite, a common size.